Press Release on the ongoing Investigations within the Refugee Management: Take into consideration refugees demands of a safe environment during the investigations. The Foundation People for Peace and Defense of Human Rights notes the slight step taken by the government of Uganda to suspend some few OPM/ Department of Refugees Offices who are suspected in what the media calls “Uganda Refugee Scandal”. We also not positive progress in the ongoing biometric verification of refugees in Uganda in order to come up with a clear estimated number of refugees and we also appreciate UNHCR Team which is so far on ground engaging with refugees. However we observe with many concerns the lack of consensus between refugees and those involved in the investigations on what should be the key issues to focus on and sometimes the failure to address refugee demands may jeopardize the real intended outcomes of these investigations the primary beneficiaries who are refugees in Uganda. It is therefore an urgent call to engage refugee leaders in their diversity ( Opinion leaders, Refugee Human Rights Defenders, Refugee Community Leaders, Refugee Led Organizations, Refugee Cultural Leaders, Refugee Business Communities, among others) in a discussion group in order to come up with key priorities which should form the basis of investigations. 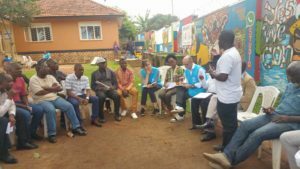 We are informed that some refugee groups have already written to different actors both the OPM/ Department of Refugees, the United Nations High Commissioner for Refugees, and to the Donors who are represented in Uganda through their Embassies about their desire to fully participate in the said investigations. We also observe that the ground on which refugee status is granted in Uganda has not yet been looked at especially with these wider views among refugees who believe that fake refugees are easily granted refugee status because of the generalized culture of bribe and genuine refugees are easily denied refugee status because they fail to bride. The resettlement process which is among the mostly affected by bribe is not yet viewed as priority and the ground on which some refugee are granted humanitarian relief aid and others no are among issues refugees are asking so many questions through social media. With the arrest and detention of Kulihoshi Musikami Pecos the executive Director of the Foundation People for Peace and Defense of Human Rights by security services here in Uganda and the fact that up to now those behind his arrested are not yet investigated and not yet hold accountable, puts at stake the desire of refugees to freely and openly engage without fear in the debate on what is called Uganda refugee scandal. 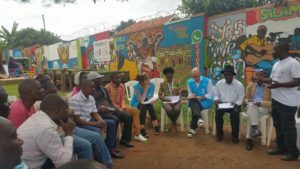 And the recent meeting between UNHCR Team from Geneva with refugee leaders in Kampala on Friday March 9th, 2018 at Kabusu Refugee Community Center among the Senior Comprehensive Refugee Response Officer of UNHCR by the names of Lesie E. Velez revealed that independent and vocal refugee leaders do not have opportunity to speak up. As usual and as it has been the culture to exclude vocal refugees, this meeting was coordinated by Carol from UNHCR and implemented by Patric the Community Liason Officer at InterAid Uganda, who only called and instructed refugees on their obedience to attend the meeting and what they should say. Good enough the information circulated and reached other refugee leaders who then also came for the meeting in order to address real refugee issues. We are concerned that OPM, UNHCR and Implementing Partners Officers who are accused by refugees in so many crimes and abuses against refugees are still active in their offices with the capacity to harm. It was not strategic that Mr.Lesie who was looking at sensitive issues of protection of refugees and other issues was accompanied by Carol who is accused by a section of Rwandan Refugees as being linked to Rwandan Government over the years and has acted against Rwandan Refugees here in Uganda, has been involved in bribe in order to push refugee cases for resettlement through the culture of Medical Reports and Insecurity Papers which have been used for long and is perceived of creating her own refugee groups for her own interests. Mr. Lesie good enough observe that Rwandan Refugees refused to speak clearly on these issues because they realized they were not safe. On the other hand Patrick has over the years implemented the theory of divide and rule among refugees and has created an empire of refugees on his obedience who are to defend what InterAid tells them, and on top of that these refugees are enemies of others refugees who think differently from them and are often used to spy on others. As a result it was observed during the meeting that some refugee leaders were told to advocate for the salary of InterAid Uganda staff rather than addressing issues affecting fellow refugees. It is interesting to note that despite the visibility of refugee leaders both in their communities and on the internet still visitors wants to meet them through UNHCR/ InterAid rather than coming to them directly. We have been viewing what is happening in the Media and we are concerned that refugee voices are not appearing, it is our position to remind everyone that “whatever you do for refugees, without refugees, you do it against them”.